Alison Chambers has been to Geneva. 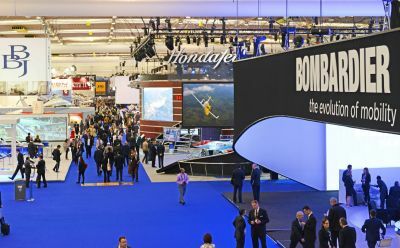 This year’s EBACE, Europe’s biggest business aviation gathering, certainly didn’t disappoint, unlike the chilly Alpine weather – with some exciting new aircraft and products showcasing in the static aircraft park and in the halls. Home manufacturer Pilatus was the star of the 13th annual EBACE as it took the wraps off its first ever jet – the PC-24. Pitched by Chairman Oscar Schwenk as a newly dubbed ‘super versatile jet,’ featuring a generous cabin and land anywhere capability, it was the price tag – US$9m – that had observers applauding. A full prototype of the aircraft, which will be powered by Williams engines with Honeywell Apex avionics, is to be readied for next year’s show with service entry planned for 2017. Bringing a new entrant into the competitive and less than buoyant light jet category may be a bit of a gamble, however. The all composite German-built Grob Spn has so far failed to get funding, and both Piaggio and Daher Socata were quiet on their potential light jet models. At the opening media lunch on Monday, sponsored by Dassault, celebrating 50 years of bizjet manufacture, EBAA CEO Fabio Gamba stated that the number of aircraft in the small/midsize category in Europe is 10% down since the 2007 peak, while production of larger, long range business jets has gone up by as much as 70%. Industry growth in Europe has stalled and 2012 has been one of the toughest years, he said, with business aviation departures down 2.1% and movements in Europe down 4.4 %. But the manufacturers must also prepare for the long term and a raft of new aircraft featured this year – ready for the upturn, when it comes. These included the high speed, long range Gulfstream 650, making its Geneva debut. Embraer’s new Legacy 500 arrived at EBACE having set a record flight of 2,362nm non-stop from Newfoundland. Bullish Ernie Edwards, Embraer’s Executive Jets boss believes the 500 and the lighter Legacy 450 will be best sellers in the family, outselling even the popular Phenoms. On a static stand Eurocopter announced an executive VIP version of its EC175 super mid-size helicopter with up to 12 seats. Pegasus Design helped style the very attractive interior. It was pleasing to see Beechcraft, which emerged from bankruptcy in February displaying at the show with a strong stand and Executive VP Shawn Vick upbeat about plans for enhancing its turboprop and piston models. Bombardier, marking 50 years of the Learjet at EBACE, displayed the first production super light Learjet 75 in a European debut on the static – just a year after its launch. Together with its sister, the Learjet 70, both are scheduled for certification later this year. And demonstrating how to command the headlines, Bombardier unveiled its all new mid-size Challenger 350, with new wing, engines and redesigned interior on day one, confirming its previously undisclosed launch customer is NetJets – which has committed to 75 aircraft. Then on Day 2 actor John Travolta flew in to talk up the 350’s excellent flying characteristics. 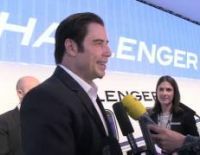 Travolta, Bombardier’s Challenger ambassador, was part of the test pilot team. He liked the aircraft very much, he said prompting Flight Evening News to run the headlines ‘The one that he wants’ and ‘Look who’s talking too.’ Celebrity sells, of course. 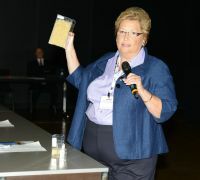 Even so, the message once again from EBAA is that business aviation is not just for celebrities and the rich and famous. Getting that perception removed is the biggest battle they face. At the Business Aviation Around the World forum on 22nd May NBAA COO Steve Brown lamented that business aviation is not seen as a business tool, rather it is seen as excessive, or unjustified. Worse still these misconceptions hinder the development of business aviation as punitive taxes by regulators continue to be applied. “We are not being helped by policy makers but we must convince them that business aviation has a vital role to play”, said Fabio Gamba. Marc Bailey for the British Business and General Aviation Association warned that the UK’s plan to introduce new fees for customs and immigration services is dangerous. “Once one country does it, others will follow”, he warned. This conference highlighted that while growth in Europe is flat – in Asia, India and Brazil, it is doing well with growth of between 15 and 20%. By 2022 business traffic in Asia is forecast to reach the same level as Europe. The requirement here is for good infrastructure and good aircraft handling – a challenge when Brazil prepares to handle a vast array of business jets at next year’s FIFA World Cup, delegates heard. 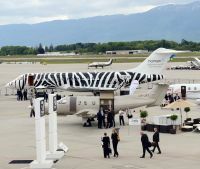 Further demonstrating the growing internationality of EBACE the one year-old African Business Aviation Association took a booth for the first time and shared it with four of its Founding Members, Dalia Air, Z Aviation Services, EAN and Bestfly. The association which has been attracting significant attention in the last six months as Africa becomes a more prominent player in the business aviation industry chose the event to make a series of announcements. It launched AfBAA Expo, a dedicated Business Aviation exhibition that will take place in parallel with the Marrakech Air Show 23-24 April 2014. The north African show already covers the commercial and military sector but this will be the first time it will incorporate a business aviation element. When asked if it was not too soon for the Association to be launching a show Tarek Ragheb the Chairman and Founder explained that he’d had demand from members, interest from the show organisers and it fulfilled AfBAA’s pledge to bring together African aviation companies from a wide variety of sectors. Ragheb also announced the launch of a series of symposia, the first of which will be held 26-27 September which aims to discuss the growth of business aviation on the continent. Recognising that charter brokers around the world play an important role in facilitating business jet bookings – and with increasingly more emerging markets enjoying the benefits of charter – it is important that small brokers have somewhere reputable to turn to when it comes to navigating complex charter requests. There are thousands of charter brokers out in the market today and that number continues to grow. Many are one or two people teams with limited overheads, often with niche expertise working with limited working capital and a small client base.